If you have dogs or cats, or any other pet, you know toys are not just a luxury; they are a necessity. There are a wide variety of dog toys available on the market today, so choosing the right ones for your dog can be quite a monumental undertaking. We are here to show you how to choose the best dog toys for your Labrador, but much of the advice can be translated to choosing toys for other breeds as well. Toys are a great boredom buster, especially if your dog is left alone for extended periods of time. Dog toys can also provide comfort when they’re feeling lonely because you are not there. Some toys are even designed to prevent your dog from developing certain problematic behaviors. Dogs are generally more than willing to play with anything they can get their paws on so that means you’ll need to be careful when choosing your dogs toys. You’ll also need to carefully monitor playtime. As a pet parent, you’ll need a number of different types of toys in your dog’s toy box. You’ll want a selection of active toys, destruction toys, and comfort toys. Active toys are made of hard rubber. These are great for carrying around or chewing, so they make for a great game of fetch. You can find them in a number of shapes, sizes, and colors. Other active toy options include tennis balls and rope toys. If you choose to use a tennis ball with your dog, keep a close eye on it as these can be chewed through. If you notice the tennis ball starting to break down, throw it away and replace it with another one. 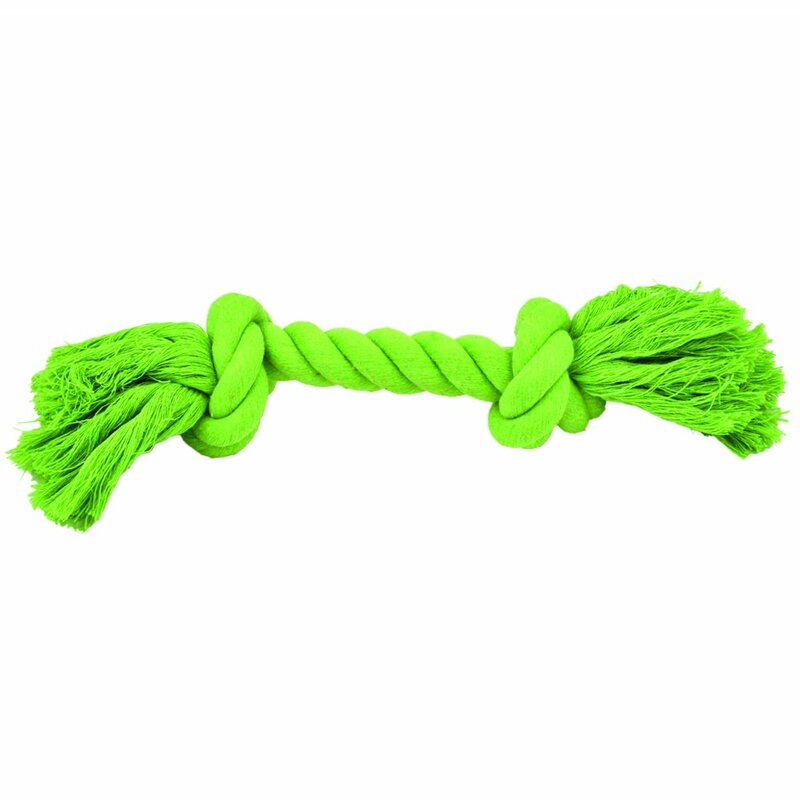 Rope toys are made in a variety of lengths, sizes, and colors. These are perfect for chewing. Keep a close eye on these however as they can fray and potentially lead to choking. Destruction toys are meant for chewing, and comfort toys are meant for snuggling. According to a study on the “perfect dog toy”, the ideal toy needs to be soft, easily manipulated, and/or make some sort of noise. The study showed dogs are quick to lose interest in toys that are hard, or don’t make a sound when they play with them. If your dog gets bored easily with new toys, get involved in their play time with the new toy. Balls are a great toy for your lab, because he’ll love going to get it for you and bringing it back to you. If your arm gets tired of throwing the ball again and again, there are plastic ball launchers available to do the work for you. Plus, the launchers will pick up the ball for you, so you don’t have to get dog slobber all over your hands when he brings it back. If you have a dog that loves to chew, look for a sturdy, but soft toy he can gnaw on. Dental chew toys are a great option, because they keep his teeth healthy and strong in the process. Consider a kong - a hollow chew toy you can fill with treats. Make sure the toys you choose are appropriate for your dog’s size, as toys that are too small can be easily swallowed. When looking for toys, check labels for child safety. Stuffed toys that are labeled safe for children under age 3 don’t contain any dangerous fillings. While soft toys are destructible, look for sturdy options that are machine washable. Make sure the toys are dog proof, or can at least be made that way. Remove any strings, ribbons, or anything that could be chewed off and swallowed. Make sure to throw away any toys that start to break or are torn. If you choose to use any squeaker dog toys, be careful. Your dog may decide that he needs to find and destroy the squeaker unit. Many of them are small enough to be ingested, so if you let your dog play with squeaky toys, make sure you are around to supervise. To get the longest possible life out of your dog toys, rotate stock to keep the dog thinking he’s getting something new. Dogs need variety to keep from getting bored, just like we do. Keep your dog toys in a box or a basket so you’re not tripping over them as they’re strewn all over the house during play. Keep the container out of reach of the dog, as he may want to chew it to get to the toys! Avoid using toys to play competitive games, like tug-of-war, if your dog is prone to aggression. This will only make the problem worse in the end. Rawhide chew toys are common, but you should always check with your veterinarian to make sure you are choosing a rawhide that is safe and appropriate for your dog. These types of toys pose a choking hazard, so make sure to only give them to your dog when you are around to watch. Many rawhide products are actually byproducts of international fur trade. If you would rather have a more humane alternative, opt for hard rubber toys. These are generally safer and last longer compared to rawhide. This peppermint scented ball is made of hard materials for durability, but they’re soft enough to keep your dog from hurting himself during play. 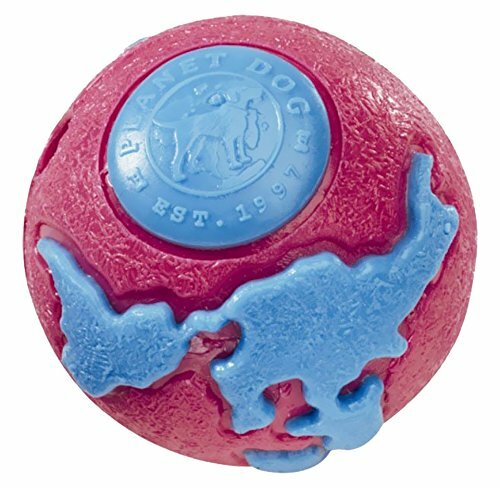 The ball is made with all FDA-approved non-toxic ingredients, and it’s even recyclable if your dog destroys it. Not only is the ball chewy, but it floats in water, and is bouncy. Since the ball is rather large with a 4 1/2 ‘’ diameter, is recommended for labs and other dogs of a similar size. It’s an awesome toy because it helps satisfy the need to retreive, while also addressing the need to chew. 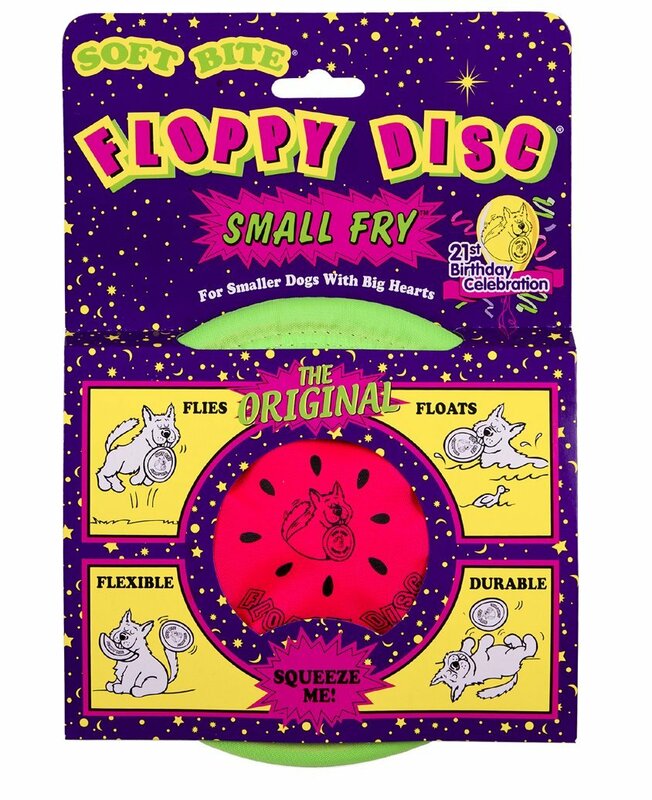 If your dog loves disc toys, but you worry about the hard plastic causing trouble, then the Floppy DIsc toy is right for you. It’s still the same disc shaped toy your dog loves, but because it is made from a soft nylon fabric and rubber material, it is safe for your dog’s teeth. The 7’’ size makes it a great toy for a number of dogs. If you love taking your lab into the water, this toy can go along with you, as it floats as well as it flies. Though it is designed as a toy for playing fetch, it can be used as an indoor toy, too. It is not meant to be a chew toy, however, so if your lab loves to chew, you’ll need to add another toy to the box. This toy is available in small, medium, and large to accommodate the size of your dog. The large size is recommended for your lab, or any dog that weighs at least 50 pounds. This kong toy is designed to be filled with food or treats. It is an interactive toy because once filled, the food or treats will fall out gradually as your dog plays. It’s easy to load, and can be ran through the dishwasher to make cleanup easy. This toy can keep any dog busy for hours with fun and safe play. Once you cut the tabs at the opening, you may want to cut them out, because it could pose a risk to the dog’s tongue. Make sure the toy has no sharp edges. Since the rubber is soft, it is easy to manipulate and file if necessary. This toy is available in small, medium, and large to better accommodate the size of your dog. For labs, or any other breed weighing at least 50 pounds, we recommend you use the large size. It’s available in a number of bright colors to keep your dog’s attention, including: green, pink, purple, orange, yellow, and mixed colors. The rope is made from natural cotton, and is dyed using edible dye, so there is no risk to your dog’s health when using this toy. The overall material is soft enough for chewing, but strong enough to withhold lots of playtime with your dog. When it gets too dirty, you can wash it with your laundry. When the toy gets old and begins to fray, replace it. The stray strands of rope may pose a choking hazard. 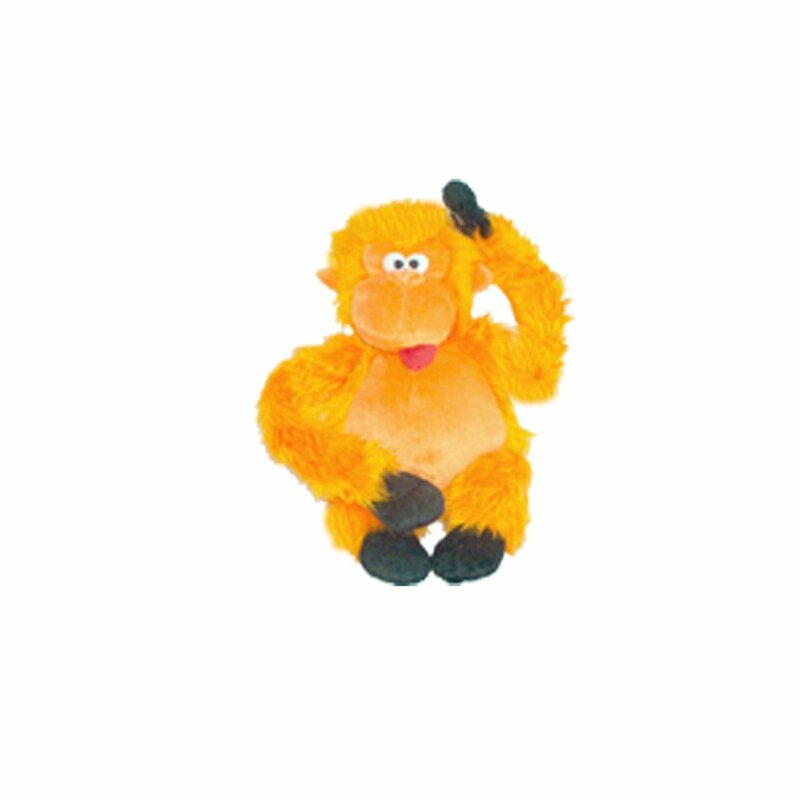 This is a 28’’ plush chew toy for dogs that looks like a gorilla. The seams are double stitched for increased durability. The toy is soft for comfort, but also features several grunts and squeakers so it makes noise to keep your pup occupied. The arms are floppy for easy carrying, and the hands velcro together for easy storage. When it gets too dirty, all you have to do is throw it in the washing machine. The toy is built to be long-lasting, but if your dog is a little too rough with it, make sure to keep an eye out for the squeakers. P.S. If you're looking for more great information about labs, check out our friends at Labrador Training HQ.com. Seriously, the amount of breed-specific information over there is ridiculous, and we use them as a resource often.